Join Us!!! We are looking for someone to help us cover Hong Kong basketball. Please send us an e-mail. A rookie-filled Japan women's basketball team crushed Hongkong, China 121-44 in a 2018 Asian Games Group Y match at Gelora Bung Karno's Basketball Hall in Senayan, Jakarta, on Wednesday. The Japan rookies - aged 22.2 years old on average - played extraordinarily well with six players reaching the double digits in points. Kadysha Juna Umezawa produced a double-double, tallying 14 points and 13 rebounds. Nagata Moe (172-G-97) led in scoring with 23 points, followed by Tamami Nakada (180-C-97) with 18, Aya Watanabe (170-G/F-92) with 14, Saki Hayashi with 12 and team captain Mio Shinozaki with 10. Meanwhile, only two Hongkong players entered the double digits, namely Li Tsz Kwan (169-F-95) and Cheuk Ting (166-PG-89). Hongkong coach Kin Ho Koon selected as starters team captain Cheuk and rookies Yan Ling Wong, Po Sze Wong, Pik Yi Lam and Wong Ka Yee (172-F-94). Japan coach Natsumi Yabuuchi, who competed in the 2004 Athens Olympics, sent out an all-rookie lineup of team captain Shinozaki, Hayashi, Saori Miyazaki (166-SG-95), Nakada and Umezawa. Hongkong's first points, which came off a fast break, apparently did not rattle Japan. With six minutes and 36 seconds left in the first quarter, Hongkong trailed by eight points, with the scoreboard reading 10-2. Cheuk Ting minimized the gap with a three-pointer with three minutes 30 seconds remaining in the first, bringing the score to 15-12, but Japan pulled away again, widening the score to 29-13 to close out the first quarter. Before the end of the first half, Japan scored another 33 points, bringing the score to 62-28, a 34-point gap. Despite its big lead, Japan did not reduce the tempo in the third quarter. Several fast breaks widened the point gap for Japan, which added 34 points to close out the quarter at 96-34. Japan added 25 points in the final quarter, winning in a landslide victory 121-44. The group stage continues for both teams, with Group Y matches that pit Japan against China and Hongkong against Mongolia on Aug. 17. 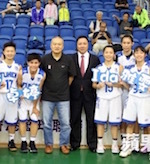 Fujian celebrated 2017/18 title as they finished the season undefeated. In the final game they edged Junan 56-53. Earlier Fujian outscored Weibang 77-50 and Qixi 75-66. Junan finished second as they beat Weibang 67-52 and Qixi 54-44. 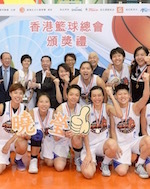 Weibang clinched third place outscoring Qixi 51-43.